FLIR Systems has announced a new version 4.2 of its ResearchIR thermal imaging software. ResearchIR 4.2 provides researchers and scientists with a powerful tool for viewing, acquiring, analyzing, and sharing the thermal data captured with FLIR’s Scientific and R&D cameras. ResearchIR Max version 4.2 gives users direct access to their MATLAB scripts within ResearchIR for the first time. This will allow users to access their customized MatLab® scripts directly in ResearchIR for specially-tailored image analysis and processing tasks. Many useful MatLab functions can now be directly accessed from within ResearchIR. In addition, ResearchIR 4.2 software also provides FLIR Scientific and R&D thermal camera users with UltraMax file support. UltraMax is a proprietary image enhancement technology available on FLIR’s Tsc-Series thermal imaging cameras. It captures a series of thermal images and combines the data into one new image using ResearchIR 4.20 software. The result is an impressive quadrupling of thermal imaging pixels, including full radiometric measurement data. With this facility images that are captured with a 640 x 480 resolution thermal imaging camera can now be transformed to an ultra-sharp 1,280 x 960 resolution image using FLIR ResearchIR. With version 4.2, ResearchIR can now be activated either with a USB key or directly online. 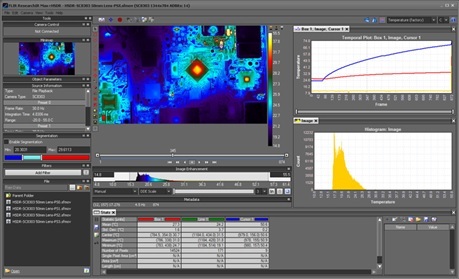 In addition to these new features, FLIR ResearchIR already includes a number of features for detailed thermal analysis including Multiple analysis tools with user defined settings for detailed data examination ; Flexible measurement modes ; Chart, graph and plot reporting and Statistical tables allowing users to view detailed image quantitative data for the image analysis tools. ResearchIR Max is a version of ResearchIR software for advanced users who need more analytical functionality in their research. To learn more about ResearchIR version 4.2’s exciting new features, please visit http://www.flir.com/researchir.